Week One. Day Three. Far less words than I should have. A few years ago I might have panicked at my current word count, but as a fifth year participant I am here to tell you it will all be okay. See, there are still 27 days left and while I know that some will be as crazy as these last couple, I also know that there will be plenty of them that will not be. I’ve also learned that given a free afternoon and some quiet I can turn out 5,000 words fairly easily. These things are all normal. Really, unless you main character died of a horrible accident yesterday or you already have a major unintentional paradox on page 3 things aren’t that bad. Even those things aren’t worth wasting precious energy panicking over. Instead, take a deep breath, drink some nice warm tea and contemplate the best next step in your characters’ journey. Now type. One word. Another. Keep going. It will happen and remember, every word you type is one more word down than you had before. If you’d like a little more impetus to help your word count, I hear a lot about ‘Write or Die‘ which will start deleting words if you take too long of a break from typing. 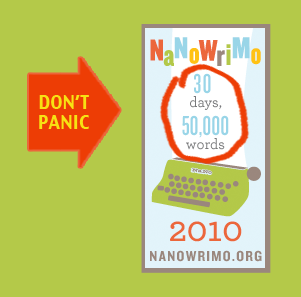 If that sounds a bit too stressful, there’s also @nanowordsprints on twitter and, of course, attending a local (or online) write in. Sure, there will be some conversing, but those 10 and 15 minute word wars can do wonders for your word count. Most of all – Don’t Panic. Previous 5 Things I Love – Nov 1 Next Special 2.5 Day Sale!